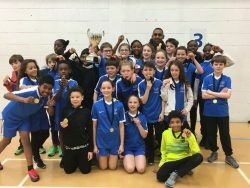 Over 30 schools entered Wandsworth Council’s annual Wandsworth Primary Sportshall Athletics competition, with Ravenstone School crowned as overall winners. Competitors came from Wandsworth, Putney and Battersea to battle it out to the top for indoor athletics. Sports included obstacle relays, sprinting and long jump. The top two schools from each heat went on to compete against each other in the grand final at Ernest Bevin College. Both teams fought hard, achieving fantastic race times on the track and outstanding results in the field events. The atmosphere throughout the day was electric and all the athletes enjoyed themselves immensely. It was incredibly close between three schools going into the final events and the lead changed hands several times. However, finishing in first place with 219 points was Ravenstone School who will be representing the borough at the School Games. The Leisure and Sports Services are managed and delivered by Enable Leisure and Culture on behalf of Wandsworth Council.